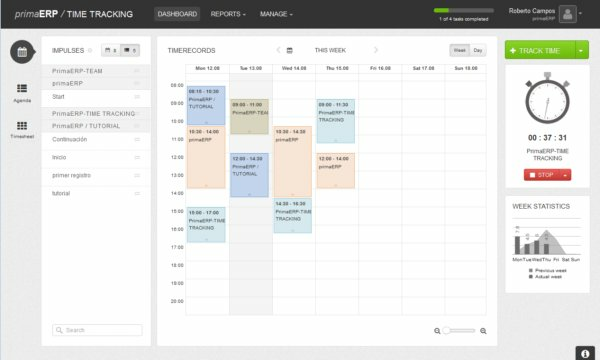 It shows the time records in a weekly or daily calendar view, allowing you to have a quick and broad view of the actions you perform. The time records created are going to be displayed in the Calendar. Track the time while you are working with the Stopwatch, either by clicking the "Start" button or dragging and dropping an Impulse on it. When you stop the Stopwatch, a time record will be created automatically based on the timekeeping performed. Create time records by either dragging and dropping either an Impulse in the calendar or by clicking with the cursor in the calendar..
You can also create time records by using the Impulses. Click on the bottom of the time record and drag it down/up in order to adjust the length of the time record. Click on a time record and drag and drop it to another position. You can also update the information of the time record by double clicking on it.